At the end of Station Road. Edinburgh Road (A703) now runs through the station site. 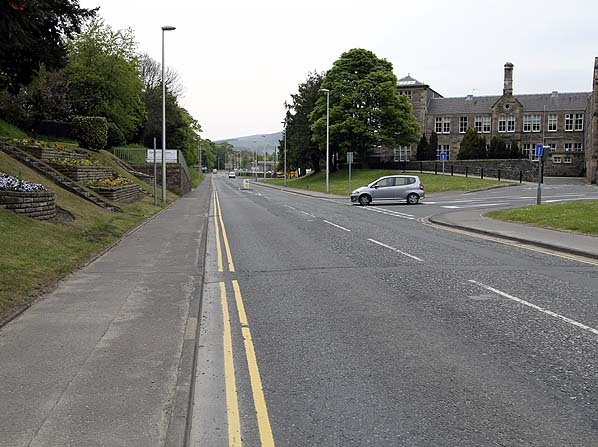 Demolished - a realignment of the A703 now runs through the site of Peebles station, and the only evidence that it ever existed is a commemorative panel at the side of the road, roughly on the site of the platform. The goods yard is now the town’s market. Both the goods office and the weigh office have been preserved and are in good condition. Notes: When the extension to Galashiels was being planned, it was clear that the siting of Peebles station would make it difficult for the line to be extended. The PR directors decided that it would be advantageous to have a joint station with the Caledonian. 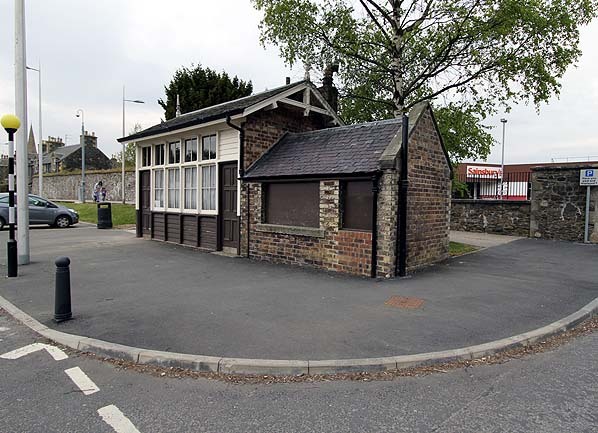 Negotiations with the CR failed to bring this about so, instead, a new PR station was constructed nearer the town centre, to the east of Northgate. It had a larger building with a long single platform but was nevertheless an unimposing structure with only basic facilities. The new station opened on 1 October 1864 with the old station being retained as a goods station and usually referred to as 'Old Station Sidings' until closure of the line in 1962. Although the old station was used for goods, an additional goods station was built to the south of the new passenger facilities, on the down side. It comprised six sidings; that nearest to the main line was a loop, passing first through a brick goods shed, and then past a wide goods dock. Two further sidings, both also loops, passed the other side of the dock. The three remaining sidings could be accessed only from the south, and these ran diagonally across the yard, with a 2 ton 10 cwt crane standing between them. Private sidings at Peebles also served Ballantyne’s Mill, Dyer and Co.’s saw mills and Peebles gas works. goods yard was controlled from Peebles Junction signal box which was on the up side opposite the goods dock. During 1905 the North British Railway substantially improved the facilities at Peebles. The original buildings were adapted as temporary waiting rooms towards the north end of the platform while the new building was constructed. The central block of the new station was a 2-storey building. It was a solid, almost symmetrical brick structure with a hipped roof. Twin entrances were positioned either side of a central window. On the first floor canted bay windows were placed on the front elevation at the corners and the centre, surmounted by a parapet. Above the central bay was a large gable pierced by an attic window and topped-off with a modest pediment. On the ground floor a canted bay window was placed at the south-east corner beneath the first-storey bay, but at the north-west corner a doorway was under the upper floor bay. A slanted glass verandah sheltered the frontage. The platform elevation was simpler, without bay windows; however, slightly south-east of centre, there was a curiously shaped attic gable thrusting through the hipped roof to end at a chimney stack. Either side of the central block were single-storey wings, the north-western one being the larger of the two. Although these had hipped roofs, they ended in gables at the ends furthest from the central block. The platform was protected by a ridged, glazed canopy of generous proportions, supported on cast iron columns. The rooms from south-east to north-west were: gents’ urinal, porters’ room, left luggage and parcels. all in the south-east wing; booking office, booking hall and agent in the central block; and general waiting room, 3rd class ladies’ waiting room, 1st class ladies’ waiting room and 1st class gents’ waiting room in the north-west wing. There was also a Menzies books stall adjacent to the booking hall. Water columns stood at each end of the platform, with a lamp room at the north-western end. The Caledonian Railway station closed to passengers on 5 June 1950, and on 25 September the North British station was renamed Peebles East; the Caledonian station, which remained open for goods traffic, became Peebles West in the same month. The line from Broughton to Peebles West closed to all traffic from 7 June 1954 (the track was removed by 1958) after which date all traffic to the West station had to use the link line from the Peebles Railway. Peebles West closed on 1 August 1959, and the junction was taken out of use. The name Peebles ‘East’ was short-lived, and the suffix disappeared from timetables in February 1958. Peebles closed to all traffic on 5 February 1962, and track-lifting through the station was completed the following year. Initially a market town, Peebles played a role in the woollen industry of the Scottish Borders until the 1960s. Today only one woollen mill remains operational in the town. In the mid-to-late 19th century the town became a popular tourist destination centred on hydropathic establishments as Peebles developed into a popular spa resort. Peebles lies at the confluence of the River Tweed and Eddleston Water. The Tweed flows eastwards, and the Eddleston flows from the north, turning to flow south-west 300 yd before the confluence. most notable of these came in 1841, when the promoters of the Peebles-based National Railway of Scotland hatched a grand plan for a line from Lancaster to Peebles where it would split, with one line continuing to Glasgow while the other served Edinburgh. A Royal Commission was appointed, and it concluded that only one Anglo-Scottish route was required which should be the Caledonian Railway's proposal for a line between Carlisle and Glasgow, with a branch from Carstairs to Edinburgh. Despite this ruling, the North British Railway opened their east coast Anglo-Scottish route between Edinburgh and Berwick in 1846, two years before the Caledonian opened their line. In the 1840s, in order to tap into the important borders woollen industry based round the River Tweed, the NBR made an approach to buy the existing 4 ft 6 in horse-drawn Edinburgh & Dalkeith Railway, which would be incorporated into a proposed new route between Edinburgh and Hawick; this received parliamentary authorisation in 1845 and the sale was completed later that year. The line was subsequently converted to standard gauge and doubled, reopening to Dalhousie in July 1847. Construction of the extension to Hawick was rapid, opening in stages as the line forged its way south. Gorebridge opened on 14 July 1847, and by 20 February 1849 it had reached Galashiels (12 miles west of Peebles), finally arriving at Hawick, where a terminus was opened on 1 November 1849. 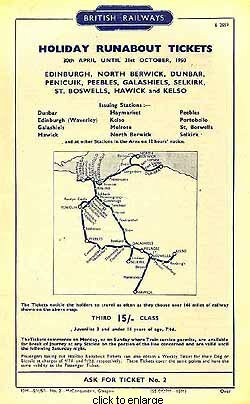 There was a proposal to include a branch from the Hawick line to Peebles but it was deleted from the Bill. A branch from the Caledonian's Glasgow route to Peebles was also dropped, but it marked the start of fierce competition between the Caledonian and the NBR to bring the first railway to the town. In the meantime an independent group was formed to promote a double-track line from Edinburgh to Peebles via Penicuik. Sufficient capital was raised and a Bill was put before Parliament in 1846, but it fell by the wayside as ‘Railway Mania’ enveloped the country. There were no further schemes until 1851 when a group of influential Peebles residents and businessmen once again put forward a proposition to put Peebles on the railway map. The suggested route would run from a junction with the Edinburgh and Hawick line at Eskbank via Bonnyrigg and Hawthornden to a summit at Leadburn, from where it would descend the Eddleston valley into Peebles, a distance of 18¾ miles. Edinburgh-based engineer Thomas Bouch was employed to survey the proposed route. Bouch was well known for building inexpensive railways, and he priced the construction of the Peebles line at £49,065 with a further £10,000 required to cover parliamentary and other costs. A locally based company was formed, and a Bill was put before Parliament. The Peebles Railway Act received Royal Assent on 8 July 1853 with an authorised capital of £70,000 in £10 shares, and additional borrowing powers up to £23,000. The Bill stipulated that the line should to be completed within five years. The first sod was cut at Peebles at a well attended public ceremony on 9 August 1853, with work also beginning at Eskbank. The board decided to work the line themselves rather than hand it over to the NBR as this would bring additional revenue for the shareholders. Staff were recruited to run the line, and suitable locomotives and rolling stock were ordered. In March 1855 the contractors, Bray and Dyson, announced that the line could be opened in May, and in April the company’s loco Soho completed the inaugural trip into Peebles from Eskbank. The first passenger train pulled into Peebles on 29 May 1855 carrying invited guests. The Board of Trade inspection followed on 28 June, and it was reported that Captain Price was ‘highly pleased with the works’. He did, however, place a restriction, with only one train in steam being allowed on the line. Considering the length of the line the company objected, and the inspector relented on the condition that the line was divided into two sections: Eskbank to Penicuik (Pomathorn) and Penicuik to Peebles. This was agreed, and the line opened to passenger and goods traffic, without ceremony, on 4 July 1855, with three daily passenger trains to Edinburgh. Intermediate stations were provided at Eddleston, Leadburn, Penicuik (later renamed Pomathorn), Rosslynlee, Hawthornden and Bonnyrigg. An additional short-lived station at Earlyvale Gate had opened by June 1855. The line was immediately popular as it offered a large reduction in the cost of transporting goods to market. The transport of livestock quickly increased, and a weekly grain market was established. The company promoted the building of housing in Peebles, with free tickets being offered for a number of years to anyone who built a new house in the area. With the immediate success of the line, and the prosperity it brought to Peebles, it came as no surprise when an extension to Galashiels on the Edinburgh and Hawick line was proposed. On 21 May 1858 the Symington, Biggar & Broughton Railway was formed to bring a second line into Peebles, from the west. Initially this local company did not give the Peebles Railway board any cause for concern; but when the Caledonian Railway decided to back the new venture it was soon clear that if this line was built it would present serious competition. In November 1859 the SB&B put a Bill before Parliament to extend their partially constructed line into Peebles. To counter this, the NBR persuaded the Peebles Railway to promote a Bill for a line from Peebles to Galashiels via Innerleithen. The NBR were determined to block any attempt by the Caledonian to extend beyond Peebles, but the Bill failed owing to pressure from the Caledonian and their supporters. The NBR were determined not to be beaten, and they formed the Galashiels & Peebles Railway with a new Bill being put before Parliament the following year. In an attempt to stop the rivalry between the two railway giants the NBR and the Caledonian came to an agreement which included a link with the Caledonian at Peebles in the NBR scheme, allowing through running for the Caledonian over NBR metals both to the PR's Peebles station and to Galashiels. The Caledonian was also given powers to build mineral depots at Innerleithen and Galashiels. Despite a last minute change of mind by the Caledonian the North British (Galashiels and Peebles) Railway Act came into force on 28 June 1861, and the Caledonian finally gave up any attempt to extend beyond Peebles. was leased to the NBR under the North British Peebles Railway (Lease) Act 1861. On 1 August 1861 parliamentary approval was give for the amalgamation of the SB&BR with the Caledonian. There was still one further line to complete the story: on 1 June 1862 the independent Leadburn, Linton & Dolphinton Railway received its Act of Incorporation for a line from Leadburn on the Peebles Railway to a junction with the Caledonian at Dolphinton. Peebles station was re-sited to the south on 5 February 1852 in connection with the Galashiels extension but the old station was retained as a goods facility. As work on the Galashiels line continued, the Caledonian's extension to Peebles opened on 1 February 1864. The Dolphinton - Leadburn line opened on 4 July 1864, and the first section of the Galashiels line opened to Innerleithen with one intermediate station at Cardrona on 1 October 1864, having opened to goods traffic several weeks earlier. Initially there was a service of four weekday trains between Innerleithen and Edinburgh, with two on Sunday. 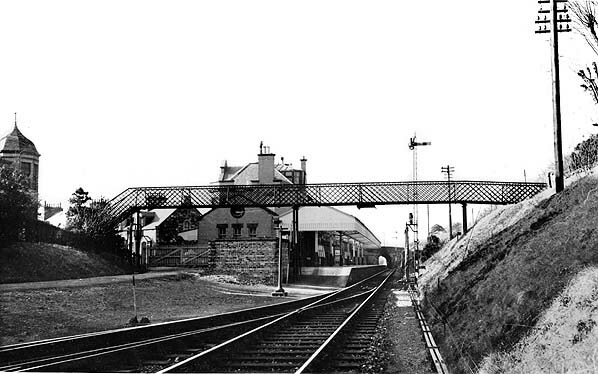 The final section of the line between Innerleithen and Galashiels opened on 18 June 1866 with intermediate stations at Clovenfords and Thornielee, a third station at Walkerburn opening on 1 January 1867. This completed what became known as the Peebles loop of the Waverley route. proposed line was strongly supported by the NBR who intended to lease and operate it. The EVR obtained their Act on 21 July 1863 and construction started on 5 September 1864. Having laid the parallel track, the Esk Valley Railway came to an agreement with the Peebles Railway. Rather than operate as two single tracks the two companies would share the tracks, operating as a double track line between Esk Valley Junction and Hardengreen Junction. On 28 June 1870 the nominally independent Penicuik Railway obtained an Act to build a 4-mile branch to Penicuik from a junction with the Peebles Railway at Hawthornden. 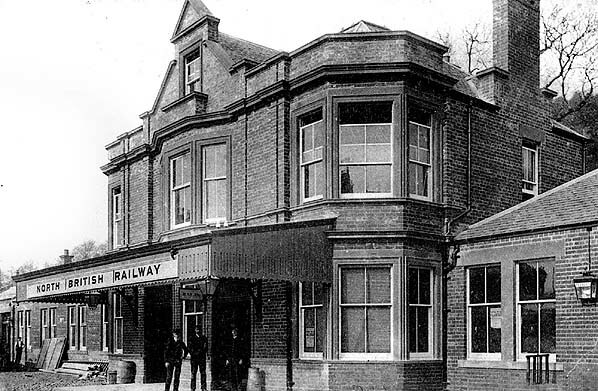 The branch opened on 2 September 1872. Both the Penicuik Railway and the Esk Valley Railway were absorbed into the NBR on 1 August 1876. In 1873 there was a proposal to double the Peebles line between Leadburn and Esk Valley Junction. Initially this was supported by the NBR, but when they withdrew their support the proposals were dropped. The line was eventually doubled between Esk Valley Junction and Hawthornden Junction. The Peebles Railway Company finally gave into pressure and was absorbed into the North British Railway under the North British Railway (Additional Powers) Act of 13 July 1876 with the amalgamation taking effect on 1 August 1876. At that time there were three daily trains between Edinburgh and Galashiels with a fourth terminating at Innerleithen. By 1910 there was a small improvement with five trains each way on weekdays, but on Sundays there was one train each way between Edinburgh and Innerleithen and one each way between Edinburgh and Peebles. In the 1923 grouping the North British Railway was absorbed into the London & North Eastern Railway. By the 1930s competition from motor buses was beginning to take its toll on passenger numbers, however the LNER did little to retain their existing passengers or attract new ones. By 1938 there was little change in the service with five weekday trains, and an additional late night service on Saturdays to bring people back from a day or evening out in Edinburgh. Unusually the outward train ran via the Peebles loop but returned to Edinburgh on the Waverley main line. By this time the Sunday service had been withdrawn altogether, and it was never reinstated. After WW2 came nationalisation, and passenger numbers continued to fall dramatically. 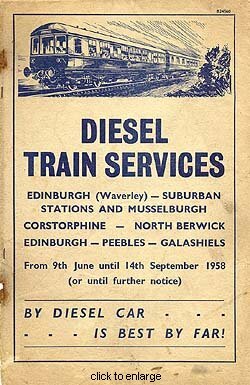 By 1951 the service had been reduced to three daily trains between Edinburgh and Galashiels with two additional trains on Saturdays. The former Caledonian line between Peebles and Symington closed to passengers from 5 June 1950; three months later the former NBR station was renamed Peebles East with the now goods-only former Caledonian station becoming Peebles West. The centenary of the opening of the Peebles Railway in 1955 was marked by the closure of the engine shed at the old Peebles terminus and the closure of the Menzies bookstall on Peebles station! It was clear that the Peebles loop was on borrowed time. In 1958 the steam service gave way to DMUs in the hope that this might revitalise the flagging fortunes of the line because they were cheaper to operate. The introduction of DMUs saw an immediate improvement in the service with eight weekday trains between Edinburgh and Galashiels and nine on Saturdays. The service remained the same until the line closed. traffic on the line is just not sufficient to justify its existence’. Despite the improved service after the introduction of DMUs passenger numbers had not improved sufficiently; and despite the campaign to keep the line open closure was announced for Saturday 3 February 1962. During that day a last-day steam railtour with 150 enthusiasts on board called at Peebles, and the last train into Peebles was the Saturdays-only service from Edinburgh which was met by a piper and almost 200 people. Detonators that had been placed on the line were set off as the last train pulled out of the station. Official closure was from Monday 5 February, with the line closing to all traffic between Hawthornden Junction (Rosewell) and Kilnknowe Junction (Galashiels). Peeblesshire became the first county on the Scottish mainland without passenger trains. There was one final service along the line on 14 March, a month after closure, hauled by B1 class 61029 'Chamois'. This was not a public train and was only for BR officials. Following this, track-lifting started almost immediately between Kilknowe (Galashiels) and Hawthornden Junction and was completed by June 1963. 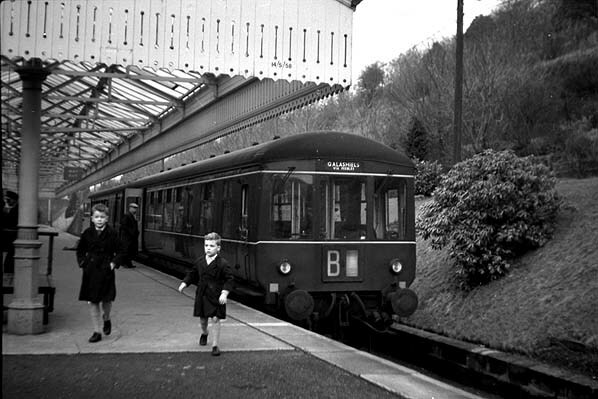 Although a local service from Edinburgh Waverley to Rosewell & Hawthornden was maintained, it was short-lived, passenger trains being withdrawn from 10 September 1962. Rosewell & Hawthornden closed completely but Bonnyrigg yard remained open until 25 January 1965. 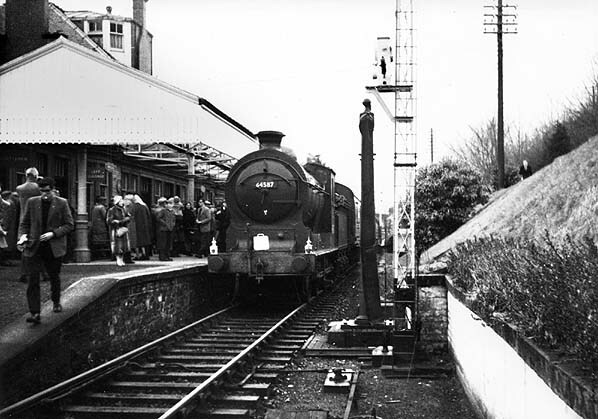 The track was singled on 29 November 1962 but remained in use to serve the goods-only Penicuik branch until 27 March 1967 when the final section of the Peebles Railway closed. BR Scottish Region fitted totems (probably after 1957) at the following Peebles Loop stations: Bonnyrigg, Rosewell & Hawthornden, Rosslynlee, Pomathorn, Eddleston, Peebles, Innerleithen, Walkerburn and Clovenfords. Tickets from Michael Stewart, Totem from Richard Furness, Bradshaw from Chris Totty, route map drawn by Alan Young. British Railways station totems (Sutton Publishing 2002) Dave Brennand & Richard Furness & Totem Study Group newsletters. 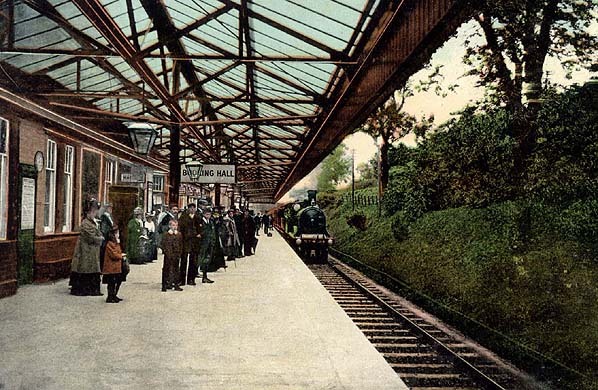 Peebles station looking north c.1905. c. 1865 1:2,500 OS map showing both the 1st and the 2nd stations. 1908 1:2,500 OS map showing the 2nd station and goods yard. 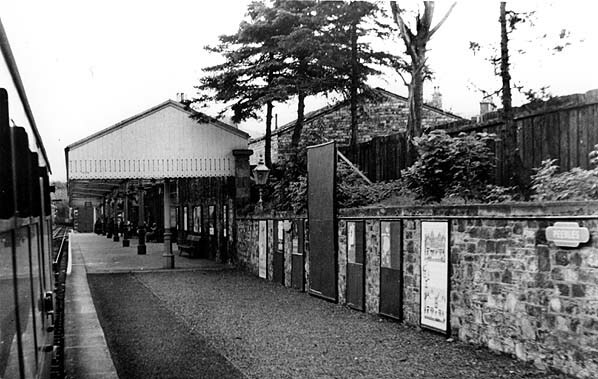 Peebles station entrance before May 1906. 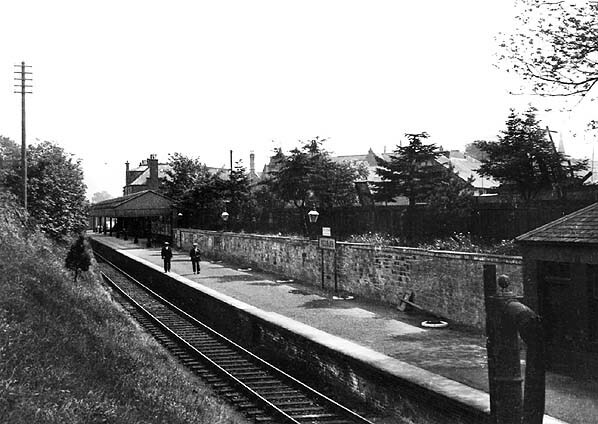 Peebles station looking south c. 1930s. Looking north towards Peebles station in March 1953. A departing northbound train at Peebles station c., 1950s. 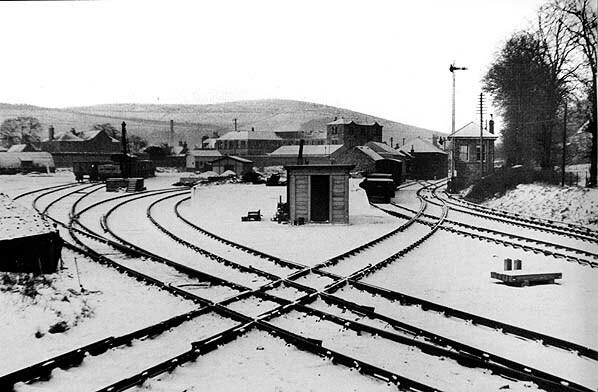 Looking north at Peebles goods yard in November 1961. Peebles Junction signal box is seen on the right and, to its left, is the goods warehouse. The wide goods dock is seen behind the platelayers’ hut. The line to the left leads to the Caledonian station. This handled only goods traffic after 5 June 1950, and in later years it was accessible only from this direction, closing completely on 1 August 1959. Working a leg of the 'Farewell to Peebles' railtour at Peebles station on 3 February 1962. 64587 is a J37 built by the NBR in 1918. Originally NBR number 467, it was renumbered 9467 by the LNER and again to 4587 in 1946. BR added the 6 in 1948, and it was withdrawn after over 45 years’ service in June 1964 at Peebles station on 3 February 1962. 64587 is a J37 built by the NBR in 1918. NBR number 467, it was renumbered 9467 by the LNER and again to 4587 in 1946. BR added the 6 in 1948 and it was withdrawn after over 45 years service in June 1964.
of passenger services over the line. 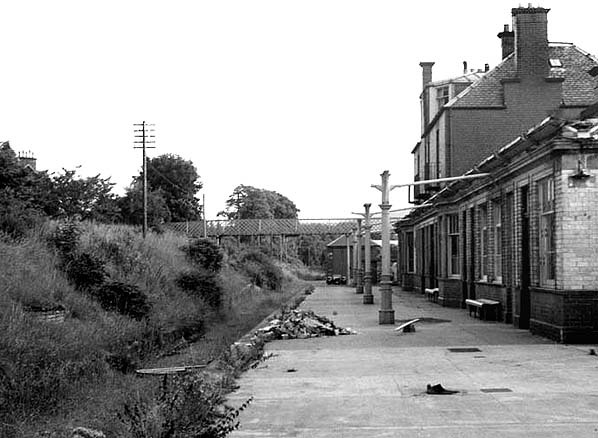 Peebles station looking south in August 1967. The site of Peebles station looking south in May 2011.
buildings at Peebles in May 2011.